Last winter I loaned my K1000 to my son with the promise that if he enjoyed using it, I’d let him keep it — but first, I’d send it to Eric Hendrickson for a complete overhaul. 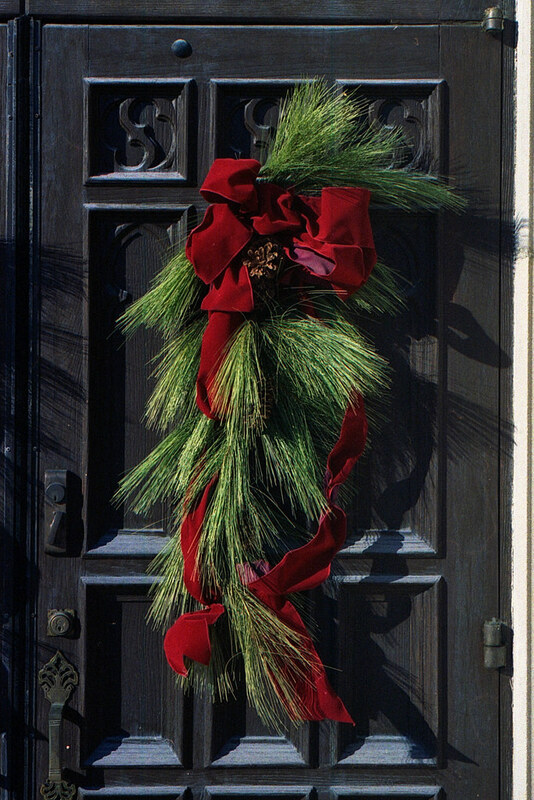 When he came home from college in the spring, he gave me the word: he’d had a great time with it and would enjoy keeping it. Along the way I picked up an ME body at a good price. I love shooting my ME — its aperture-priority shooting suits me, and its smaller size makes it more pleasant to carry. I figured my son might like one, too. So I sent both cameras to Eric, who returned them to me recently, smelling factory fresh, ready to serve for at least another 20 years. Both cameras are in my son’s hands now. 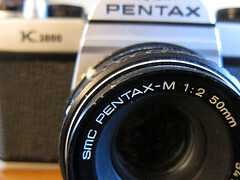 A longtime reader of this blog offered me a spare 50mm f/1.7 SMC Pentax-A lens that he no longer wanted, for my son’s ME. It was a generous gift, and my son gratefully accepted it. Margaret and I keep walking Indianapolis neighborhoods, considering where we might like to settle after we’re empty nested in a few years. The neighborhood around 56th and Illinois appeals deeply to me. I think every film has its use. I just hadn’t found the right one for Kodak Gold 400 yet. I just haven’t liked the color I get when I use it. 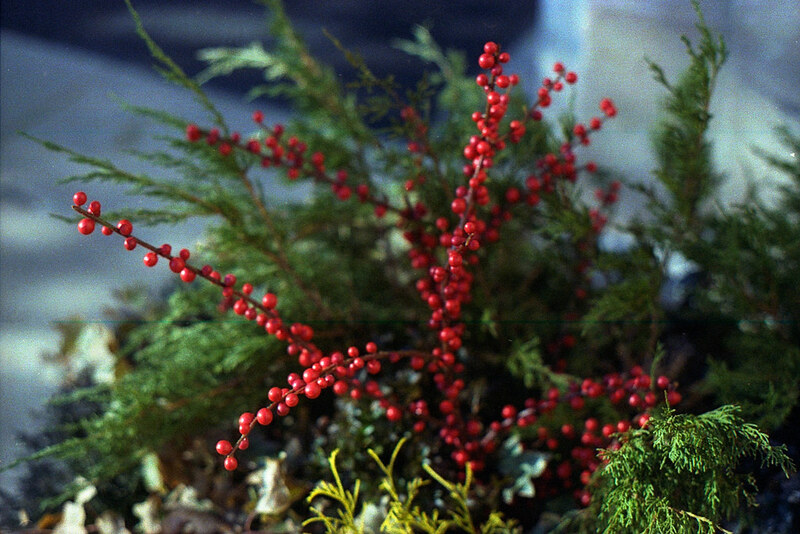 But it yielded surprisingly good color in my K1000 with this 55/1.8 lens. It’s still truer-than-life Kodak color, saturated, candylike. 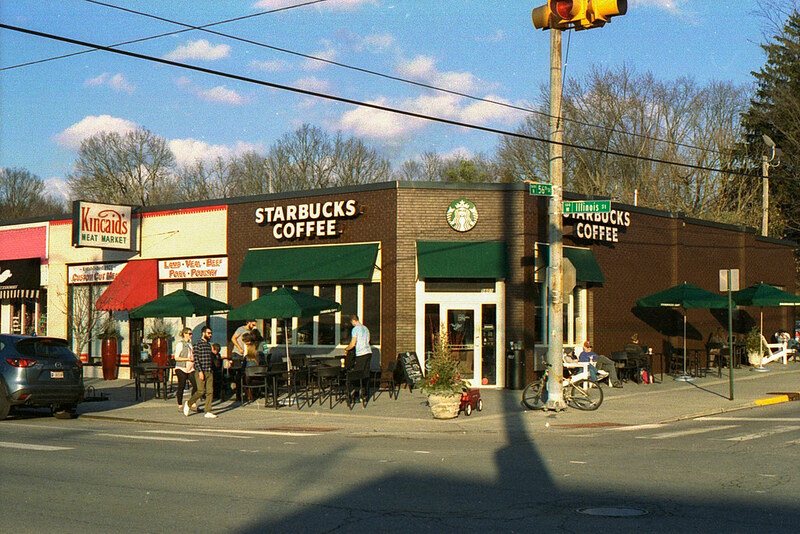 But it captured the dusky hues here pretty well, and that’s not something I expect from consumer-grade Kodak film. 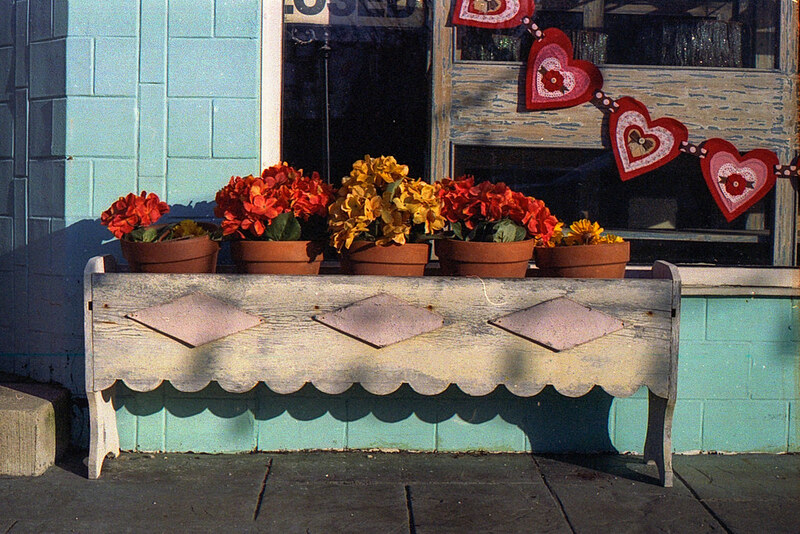 Photo: Planter box on Illinois Street. 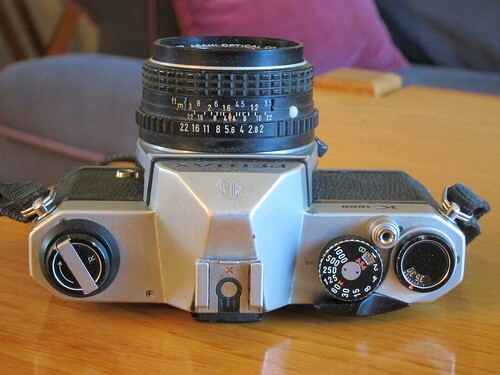 I am wasting my time shooting any normal prime lens on my Pentax cameras other than this 55mm f/1.8. Just look at this! Such color, such sharpness, such sensitive detail! On workaday Kodak Gold 400 no less! 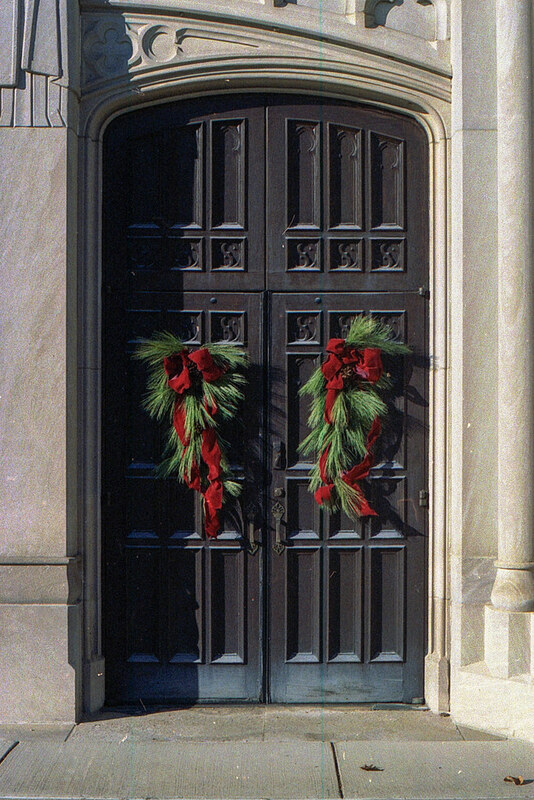 On the same day I photographed Second Presbyterian Church with a 28mm lens, I brought my Pentax K1000 with this 55mm f/1.8 lens too. While that 28mm lens really brought this giant church into the frame, this 55mm lens did a much better job of capturing the church’s detailed beauty. 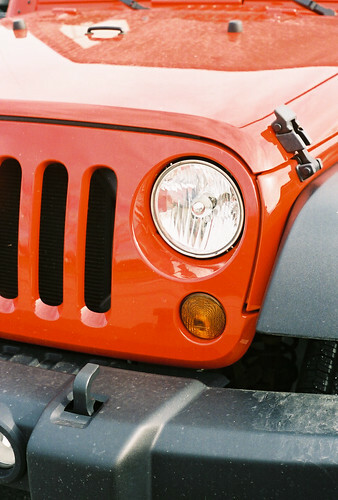 That Kodak Gold 400 surely likes red. And this lens handles beautifully. 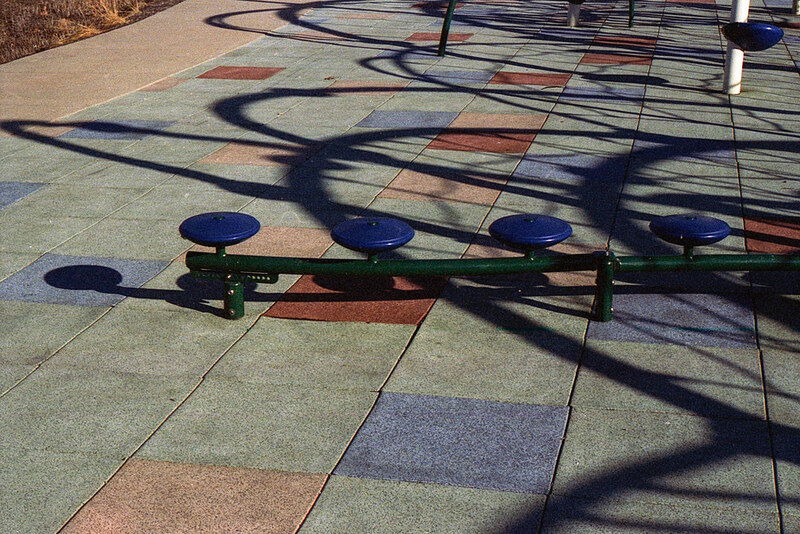 I took the K1000 and this lens to several favorite photographic haunts, including Juan Solomon Park. 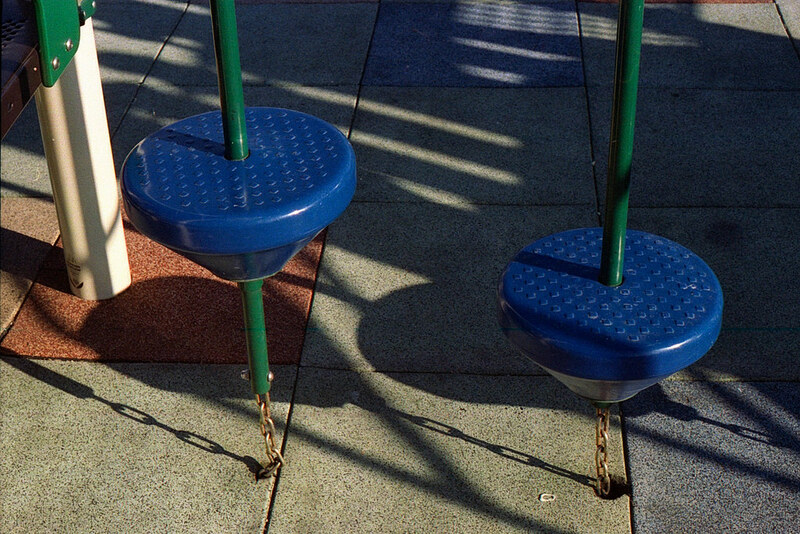 I’ve shot its colorful playground many times since it opened several years ago. There’s actually been a playground here since before I moved to Indy in the 1990s. The city just redid it from the ground up when they used this park site for a building that is part of an expansion of sewage services to this part of the city. The old playground was fine, but the new one is top flight. I especially love the colorful play surface of soft replaceable tiles. 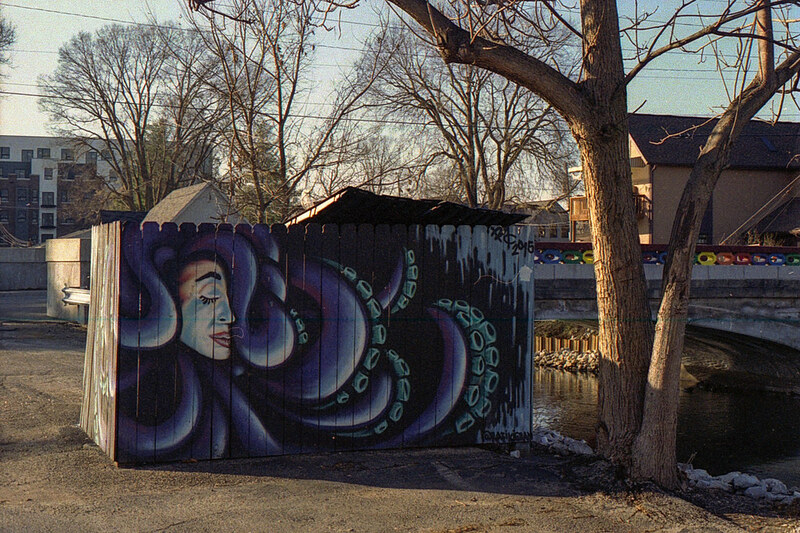 I also took the K1000 over to Broad Ripple one chilly day for a walk. 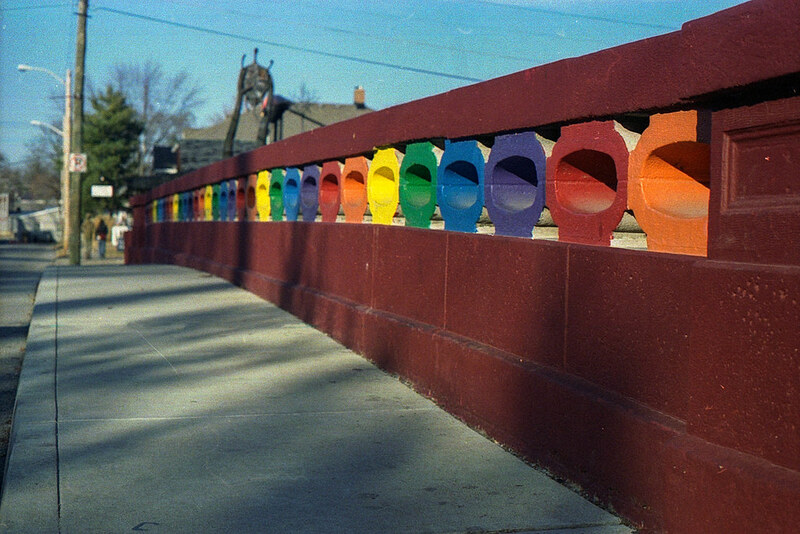 I’ve photographed this unusual bridge railing many times. The bridge was built in 1906, but a couple years ago the railing was altered. The row of blocks below the links was added, I assume to increase the railing’s height for safety. The purist in me thinks this was a shame. I just thought the painting on this dumpster enclosure was interesting. I usually shoot my 50/1.4 SMC Pentax-M lens on my K-mount cameras, but it doesn’t deliver the color or detail that 55/1.8 does. I’ll just admit it: I use that 50/1.4 partially because of that vaunted 1.4 number, as if it says something about me as a photographer. Nuts to it. I’ll let my work do the talking. And with this 55/1.8, I’ll definitely have something to say. 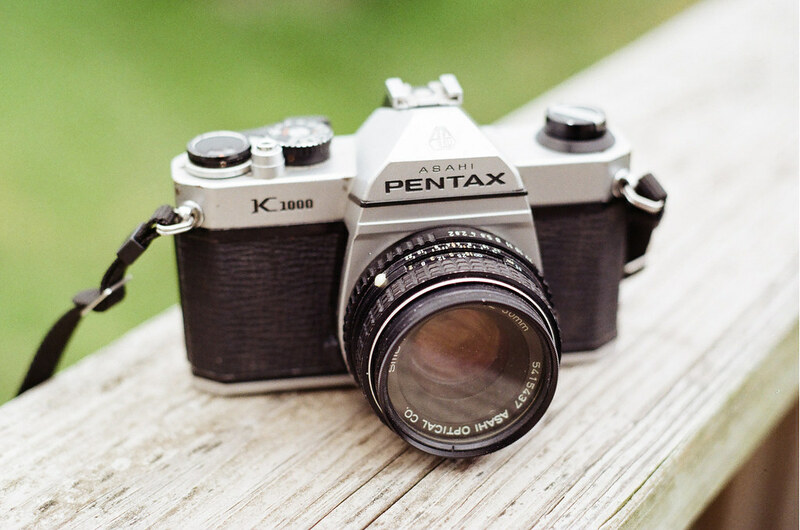 The first 35 mm SLR camera I ever used was a Pentax K1000. My ex-wife was a professional photographer; the K1000 was her everyday camera. It was a point of personal pride that she eschewed the built-in light meter and set her own exposure. At family gatherings she would set exposure and hand me her camera so she would appear in at least a few photos. From my perspective, she was the camera’s autoexposure system! Nostalgia fueled a desire for a K1000 of my own, but high prices kept me away. I guess I’m not the only nostalgic one! 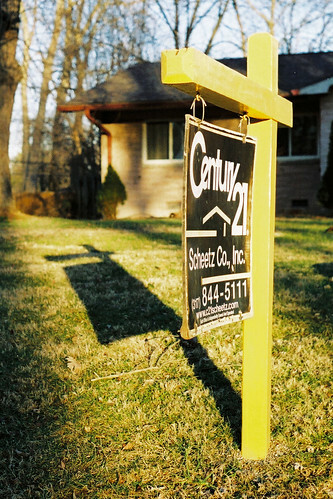 I caught a bargain last year on a Pentax ME, and when I wrote about it here I mentioned my K1000 yearnings. I forget that my brother reads my blog. His Christmas gift to me was this K1000. Pentax made K1000s for a healthy 21 years, from 1976 to 1997. Production began in Japan, moved to Hong Kong in 1978, and moved to China in 1990. Japanese K1000s say “Asahi Opt. Co., Japan” on the back; later K1000s (like mine) just say “Asahi Opt. Co.” Collectors value the Japanese cameras more than those from Hong Kong, but cameras from either origin appear to me to be of equal quality, made almost entirely of steel. When the Chinese took over, cost-cutting measures led to internal parts made of cheaper materials and top and bottom plates made of plastic. That doesn’t make them bad cameras – they are just slightly less bulletproof than their predecessors. Chinese K1000s lack the word Asahi and the funky AOCo logo on the pentaprism cover. 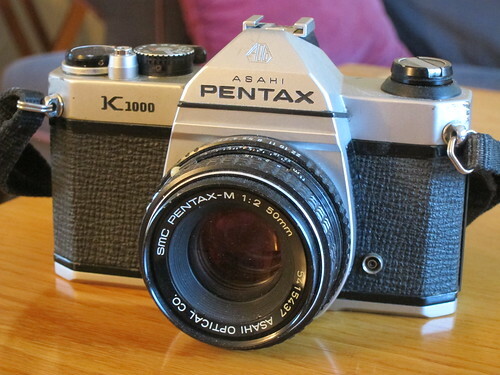 The K1000 was among the first cameras to use Pentax’s then-new K lens mount. Pentax has stuck doggedly with this mount – I can snap my K1000’s SMC Pentax-M 50 mm f/2 lens right onto the latest Pentax digital SLRs. An astonishing variety of K-mount lenses are available. The lens that came with my K1000 is a typical prime lens. The SMC in the name stands for Super Multi Coating, a highly regarded lens-coating process. You’ll find a handful of prime lenses attached to K1000s you encounter – 50 mm lenses at f/1.2, f/1.4, f/1.7, and f/2.0, and a 40 mm lens at f/2.8. You’ll also find lenses labeled Pentax-M, Pentax-A, and just plain Pentax. The plain Pentax lenses are generally the original K-mount lenses. The smaller and lighter M series lenses came next. The A series lenses came next, and allowed later Pentax cameras to control aperture automatically. The K1000 brooks none of that auto-exposure nonsense, of course. Its only concession to convenience is its light meter, which is powered by a single LR44 cell available at any drug store. A needle inside the viewfinder tells you when you’ve properly exposed your shot. Adjust aperture and shutter speed until the needle moves into the gap. Above the gap, the shot is overexposed; below the gap, it’s underexposed. Pro tip: Put a cap on your K1000’s lens when you’re not using it. There’s no on-off switch; when light hits the CdS-based light meter, current is drawn and the battery is drained. Guess how I learned that. But no matter; I set exposure manually and just kept on shooting. The top view tells the rest of this camera’s story. Its horizontal-travel focal-plane shutter operates from 1 to 1/1000 second, plus bulb. You can set it to work with films from 20 to 3200 ASA. If you put a flash on its hot shoe, it syncs at 1/60 sec. My K1000’s winder is a little stiff and can be balky. I lost my first roll of film when winding stripped the film’s sprocket holes, so I wound more gently on my second roll. Otherwise, the K1000 performed flawlessly. It’s a large, heavy camera, but not so much so that I couldn’t hold it to my eye with one hand and focus with the other. I quickly built confidence with it, and by the end of the roll had its operation down. I used my usual film, Fujicolor 200. This first shot is of a Jeep in the parking lot at work. I don’t normally shoot with my old cameras much during the winter, but this year the weather has been unusually temperate. One sunny afternoon I drove around looking for subjects. 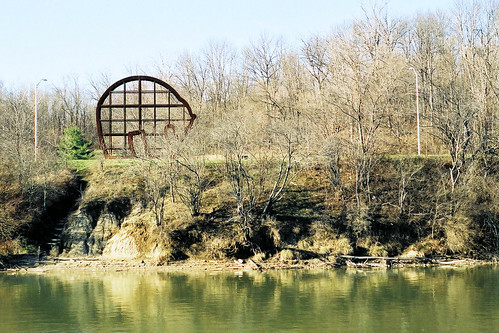 This bear guards the reservoir at Eagle Creek Park, a real gem in the Indianapolis park system. 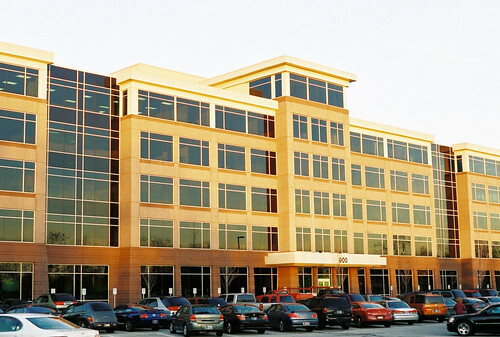 The office building in which I work is a frequent subject. This morning, the early sun was especially warm and golden. The abandoned house across the street has finally been put on the market. I shot this and then realized that the battery powering the light meter had died, so it’s just blind dumb luck that this shot turned out. In these shots I see the same bokeh and rendering of color I remember in the family shots my ex took with her K1000. 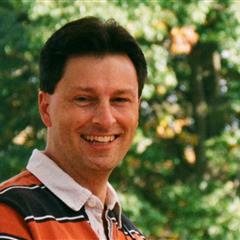 Given that I always liked my ex’s family shots, I call that a good thing. See my entire Pentax K1000 gallery here. Do you like old cameras? Then check out my entire collection!